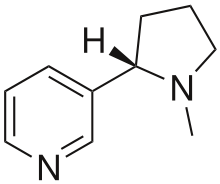 Nicotine is a potent parasympathomimetic alkaloid foond in the nichtshade faimily o plants (Solanaceae) an a stimulant drog. ↑ D'Souza MS, Markou A (2011). "Neuronal mechanisms underlying development of nicotine dependence: implications for novel smoking-cessation treatments". Addict Sci Clin Pract. 6 (1): 4–16. PMC 3188825  . PMID 22003417. Withdrawal symptoms upon cessation of nicotine intake: Chronic nicotine use induces neuroadaptations in the brain’s reward system that result in the development of nicotine dependence. Thus, nicotine-dependent smokers must continue nicotine intake to avoid distressing somatic and affective withdrawal symptoms. Newly abstinent smokers experience symptoms such as depressed mood, anxiety, irritability, difficulty concentrating, craving, bradycardia, insomnia, gastrointestinal discomfort, and weight gain (Shiffman and Jarvik, 1976; Hughes et al., 1991). Experimental animals, such as rats and mice, exhibit a nicotine withdrawal syndrome that, like the human syndrome, includes both somatic signs and a negative affective state (Watkins et al., 2000; Malin et al., 2006). The somatic signs of nicotine withdrawal include rearing, jumping, shakes, abdominal constrictions, chewing, scratching, and facial tremors. The negative affective state of nicotine withdrawal is characterized by decreased responsiveness to previously rewarding stimuli, a state called anhedonia. ↑ Cosci, F; Pistelli, F; Lazzarini, N; Carrozzi, L (2011). "Nicotine dependence and psychological distress: outcomes and clinical implications in smoking cessation". Psychology research and behavior management. 4: 119–28. doi:10.2147/prbm.s14243. PMC 3218785  . PMID 22114542. ↑ Mannfred A. Hollinger (19 October 2007). Introduction to Pharmacology, Third Edition. Abingdon: CRC Press. pp. 222–223. ISBN 978-1-4200-4742-4. This page wis last eeditit on 14 Februar 2018, at 06:25.